Managing an acolyte program, like managing any volunteer program, requires knowledge, skill, the ability to plan, budget, write reports, and most importantly, the ability to train, motivate, and encourage people. 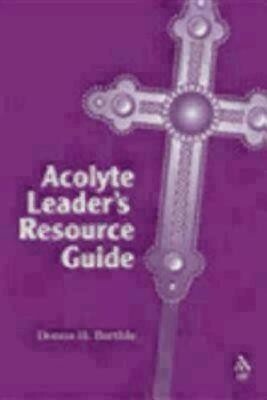 The Acolyte Leader's Resource Guide provides everything someone new to managing an acolyte program needs to know, as well as tips that even the most experienced leaders will find useful. This manual will help any acolyte director manage an effective program and cut down the administrative duties to a reasonable size. Beginning with a history of the acolyte ministry itself, Donna Barthle, an experienced acolyte leader, provides details on the duties of each acolyte position, followed by suggestions for dealing with training, scheduling, maintaining rosters, budgeting, writing reports for the vestry, and general supervision of acolytes and the program. Instructions for training acolytes for regular Sunday worship as well as festivals and special services, plus sample forms and letters to use in managing the program, make this an indispensable resource for acolyte leaders. I'm the author/artist and I want to review Acolyte Leader's Resource Guide.